Two travellers accomplished something that seemed impossible: crossing the world’s largest country by bike. For years I had dreamed of this moment. In my fantasies, I envisioned beginning this journey on a silent beach of gray pebbles, the cool air filling my lungs. After seven years of planning, on the cold spring day when Ellery and I arrived at the sand beach by Sportivnaya Harbor in Vladivostok, a pack of Russian reporters pounced on us with questions, pushing microphones in our faces as we mustered replies with chattering teeth. While cycling over the mountains outside Vladivostok that day, I took one last glance back at the sea. In front of us lay a journey of roughly 9,940 miles, across 11 time zones and two continents. Before starting our trip, Ellery and I made business cards with our website that read: “The Idiots.” It was a reference to Fyodor Dostoevsky’s classic novel, The Idiot —and the admittance that cycling across Siberia requires a healthy dose of insanity. But Russian people didn’t think we were idiots at all. The cameramen filming us in Vladivostok filed reports that were beamed into television sets from Moscow to Magadan. The next morning, everyone knew who we were. Carloads of well-wishing locals rolled down windows, smiling and waving as they passed. “Hello, my American friends!” a car of young Russians yelled, as they slowed to our pace on the second morning of our trip. “ Zdravstvuite . Hello,” I said, choking through the exhaust as we rode side-by-side. “Is this part of the 2014 Olympics in Sochi !” asked the driver, a bright-eyed youth named Ivan. A guy in the back thrust a pen and notebook out the window. “Can we please have your autograph?” he asked. After we stopped to sign their notebook, Ivan wrote down his phone number for us. And that’s how it went during our journey across Russia; in cities and small towns, locals often shared their meals and offered to take us in for the night. Wherever we went in Russia, we always found new friends. While cycling in Siberia, there are many things to worry about: freezing temperatures, poor roads, fearsome bears, Siberian tigers and drunk drivers. National Geographic writer Mark Jenkins, who cycled across Russia in 1989, told us to rethink our entire trip. Before we left, Jenkins informed us via email that the “Westerlies”—headwinds that blow west to east in northern latitudes—would gale against us. It was one more difficulty added to an arduous expedition. We would be riding against the wind. But the biggest challenge we faced were the ticks. In Eastern Siberia, some ticks carry a rare disease called tick-borne encephalitis, which, if transmitted to humans, can result in sickness, nerve damage and even paralysis. Ellery and I got the first shot to vaccinate us against the disease in Vladivostok, and we received a secondary booster in Khabarovsk (the first major city we reached). The vaccination for tick-borne encephalitis temporarily weakens your immune system, and even contracting a cold can make you severely sick. A day’s ride from Khabarovsk, Ellery came down with extreme food poisoning—a direct result of the shot—and received medical attention in a local hospital. The sickness damaged his stomach so much that he became ill once a month for the rest of our journey across Siberia. After returning to the U.S., Ellery had an appendectomy. During the surgery, his doctor noticed extreme scaring on his intestines. “You’re lucky you made it back home from your bike trip alive,” the doctor said. At the time of our trip, a 500-mile length of the Russian Federal Highway—the main road which connects Vladivostok with Moscow—was unpaved. On a road map, the dirt road section of the Federal Highway appeared as a sinuous red line connecting scant dots representing small towns. It curved around the northern tip of China like the handle of the Big Dipper. The dirt road was in such bad shape, it often took us 10 hours just to ride 50 miles. We often hitchhiked back to regional capitals to see doctors when Ellery got sick. They prescribed medicine, but he always became ill again. Stubbornly, we kept going. Despite the difficulties, we encountered natural beauty and rich cultures. The dirt road section took us through the breathtaking Stanovoy Khrebet Mountains. The road met pavement again outside the city of Chita, and we cycled into the Buryatia—home to the indigenous Buryat people of Siberia. Our trek through Buryatia led through rolling mountains peppered with Buddhist monasteries and ended at Lake Baikal —the world’s largest freshwater lake. From Lake Baikal to Moscow, you start measuring distances in 930-mile chunks. Nine hundred and thirty miles of rolling hills separates Baikal from the city of Krasnoyarsk. Another 930-mile section of flat steppe runs between the Siberian cities of Novosibirsk and Yekaterinburg , where we battled the fierce headwinds Mark Jenkins had warned us about. On a horizontal plain west of Novosibirsk, Ellery and I once pulled over to change our fourth flat tire of the day (about the 16th flat tire of the trip). Meanwhile, Ellery’s stomach gurgled with another onset of food poisoning. In either direction, there wasn’t so much as a tree or fencepost. I bent over in the summer heat to change the flat, rubbing my 2,796-mile-soar rear end, and watched Ellery’s curly hair bob up and down in the drainage ditch he found to relieve himself. Just then, a carload of excited Russians pulled over to meet the fearless adventurers they had seen on Russian TV. I tried to distract them from my companion, who was squatting in a ditch next to a puddle of diarrhea. Outside Yekaterinburg, we crossed the Ural Mountains and entered another 930-mile stint characterized by heavy traffic. We stopped in Tatarstan’s capital city of Kazan . Tatarstan is an independent republic of the Tatar people, who practice Islam. Suddenly, mosques replaced the Orthodox churches we became accustomed to cycling past. In mid-September, we arrived in Moscow. Leaves had changed to an autumnal crimson. Winter would soon arrive. We cycled fast, south toward Ukraine. Details which made Russia feel like home—the theme song for the national evening news, colloquialisms I used when talking to young people, letting old women cut in line—were about to fade away. Standing at the Ukrainian border, I took one glance back at the windswept Russian hills and felt a mixed sense of triumph and nostalgia. Ellery and I had accomplished something that, for so many months, had seemed impossible. 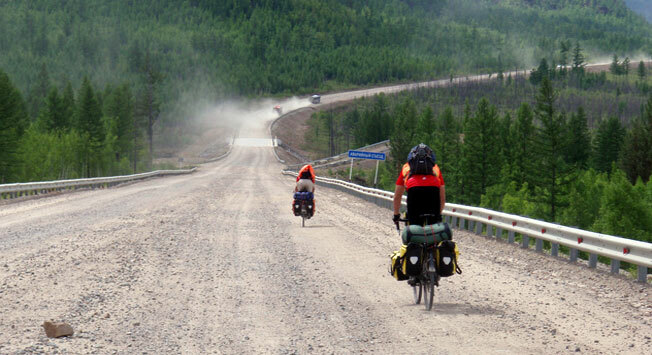 We had now joined the handful of others who have cycled across Russia—the world’s largest country.